My apologies for being absent around these parts. I’ve been enjoying using the site so much for all the recipes there are here, rather than posting new ones. I thought I had these beans in here and went to go make them and by gosh I couldn’t find them. Turns out it was all in my imagination. On a side note; Belgian white ale wasn’t really on our tasty radar until we drank it at Frank and Niki’s wedding. My, it’s refreshing without being filling, perfect for a warm day. What I absolutely adore about this recipe is that it isn’t sweet, like so many baked bean recipes are. If you have a fresh sprig of rosemary, do use it, the aroma coming from the oven will about drive you mad! If you want to turn this into a one pot meal just brown a pound of ground turkey, pork or beef along with the onions. Saute until translucent. Optional to brown a pound of ground turkey, beef or pork. 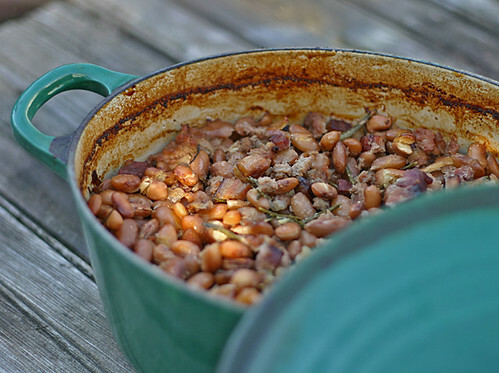 1 Pound Dried White or Pinto Beans that have been soaked over-night. 2 Bottles Belgian Style White Ale like Hoegaarden – just enough to cover the beans. Once mixture comes to a boil, cover and place in a 350 degree oven and bake until the liquid has been absorbed. About 2 hours. If beans do not seem done after the liquid has been absorbed you can add more beer or water or chicken stock. After one hour remove the lid so the beans can brown nicely. Good recipe, Mary!! I’m always looking for a bean recipe without the standard brown sugar. This should fill the bill. Thank you! !